I’ve always loved this quote by Churchill. 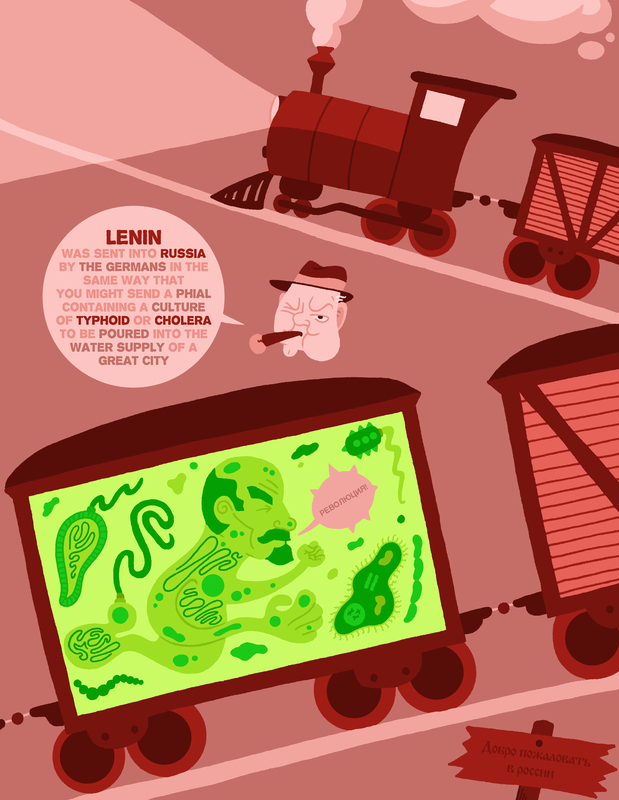 More specifically, I’ve always loved a pithier, more poster-ready paraphrase of it (“The Germans sent Lenin into Russia like a bacillus, sealed in a train car”). The real quote is a little longer and was harder to fit artfully into this design. A note to fellow cartoonists/illustrators: never save double checking that quote for last! I hope the multicolored text livened up the big block of words. It might have made it too busy, though. I tried to give it kind of a word-cloud feel, with the words’ coloring reflecting their significance. Anyway, back to the quote. I just think it’s a really great metaphor and have thought about it on and off over the years. A man bottled up like a biological weapon — that’s so evocative! And it’s so visual. It seemed like a go-to illustration for me, especially since I’m so into the USSR. I’m not sure I did it justice, but I really couldn’t afford to spend more than a couple of days on it. I’m sure I’ll revisit the concept sometime soon. The part of the picture that I’m proudest of is actually Churchill, who was a lot easier to draw than I would have expected. I kind of wish I’d featured him more prominently. He’s got a pretty easily-caricatured face, so it’s no great boast to do a passable Churchill. Drawing him is probably equivalent to impersonating Christopher Walken or William Shatner or somebody like that. You get huge, can’t miss ’em quirks to build your imitation around. With Churchill, you don’t have room for a lot of likeness once the hat, jowls, and cigar are in place. Still, I’m no caricaturist, so I’m proud. Surprisingly, I could be prouder of the Russian text. Lenin’s font is particularly lackluster/inappropriate. I wanted something that could have come off a Bolshevik leaflet, but it was really, really hard to find free Cyrillic fonts. The two I used don’t feature all the Cyrillic characters so I had to make my Яs, Юs, and Ьs from scratch. I’m also not sure that my Russian is correct, but here was what I meant to say. Lenin is saying (hopefully) “Revolution!” and the sign in the bottom right reads “Welcome to Russia” (God willing). I can’t believe that I was majoring in this language just a few year ago. My biggest regret of all is that I can’t find some way to reuse this in my monster book. I guess “B” could still be for Bolshevik, but, if I didn’t use my dad’s suggestion of “Y is for Young Republican,” than I’m certainly not going to do that.